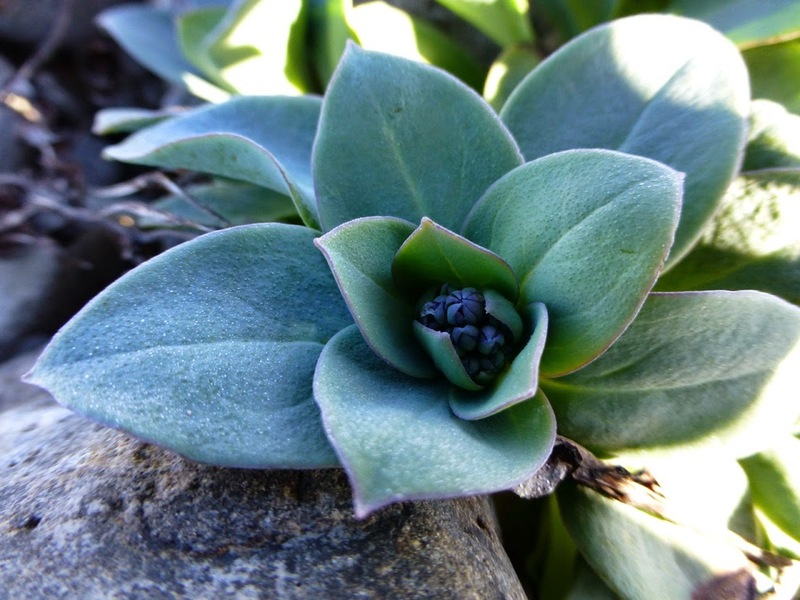 Oysterplant in Muckle Uri Geo. Although the wind remained from an easterly direction, the rest of the weather proved a bit of a mixed bag and hampered the birding at times. Fog on Monday cleared in the evening, then a clear day on Tuesday also saw a rather harsh NE wind before a very promising start on Wednesday was quickly overshadowed by thick fog coming in from the start of census. The poor visibility on 21st felt as if it was stopping us unleashing the potential of the easterly winds, with new migrants including the first Tree Pipit of the year, a Stonechat, Grey Wagtail and Black Redstart presumably the tip of the iceberg of what was out there. A few wildfowl and waders were also located, including 2 Tufted Duck, 3 Goldeneye, 4 Whimbrel and an impressive peak of 106 Golden Plover, whilst lingering birds included a Stock Dove and Redstart. Migrants had clearly increased on 22nd, but were not easy to find in the strong blustery wind, with the first Wryneck of the year in South Raeva the highlight. There was also a Short-eared Owl, the first Common Sandpiper of the spring, 2 Goldcrest, Tree Pipit, 2 Kestrel and peaks of 8 Willow Warbler and 12 Brambling, whilst other sightings included a badly oiled male Peregrine (possibly the remnant of the breeding pair suffering from skirmishing with Fulmars) and the lingering Kumlien’s and Iceland Gull (with the latter also present on 23rd). Not a bad day, but it improved further with a timely call from Deryk (about 30 seconds before the start of Log!) to say he’d just had a Crane head north over Quoy. The Wardening team dashed out the Obs and scanned from various high points, whilst Susannah took the more measured and sensible approach of driving down the island with the guests and actually seeing the bird, which headed off towards Hoini into the gathering darkness and out of sight by the time the Wardens made it down the island. Ah well, hopefully there’ll be others this year! A slightly calmer wind and clear skies saw no sign of the Crane on the early morning of 23rd, but it was clear there were more birds in, with the morning traps and nets producing a lively selection including a Wryneck, 2 Ring Ouzels and a Redstart. 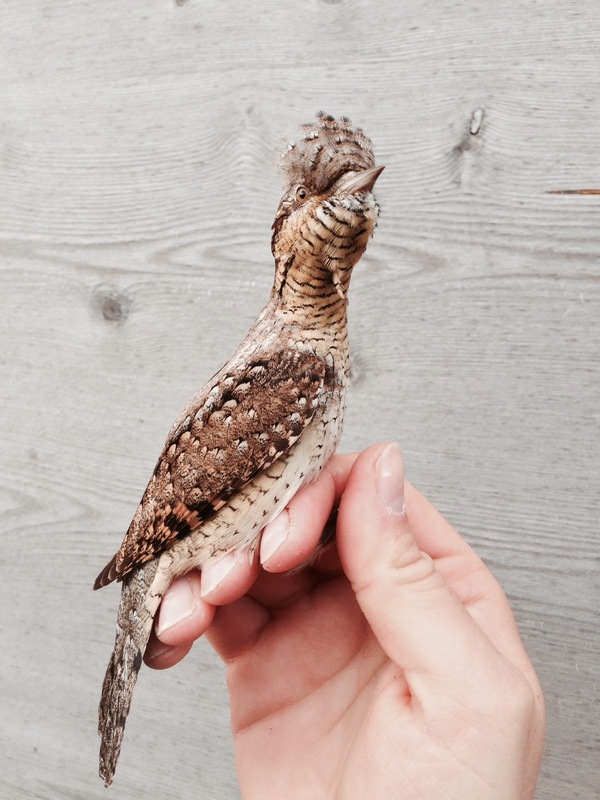 The Wryneck caught in the Plantation this morning was an early sign that it was going to be a good day. However, with the wind swinging slightly towards the SE, a real pea-souper came in and birding became quite difficult for most of the day (and pretty much impossible in the North). Still, with birds having arrived early on and a few things probably still dropping in during the day, a healthy total was logged, with the highlights comprising 4 Wryneck, a Great Grey Shrike (the second of the spring) and the first Whinchat of the year. 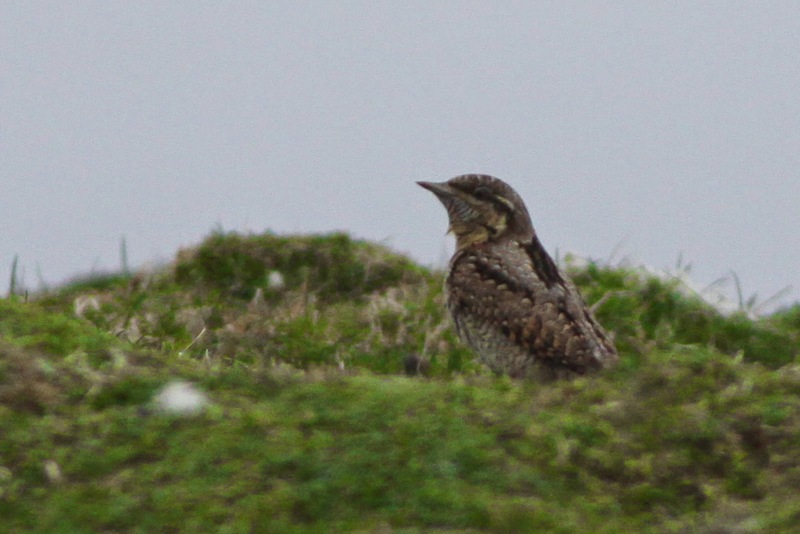 Further Wrynecks were seen at South Harbour (the bird pictured), Field Ditch and Haa/Nether Taft. After a poor year in 2013 when only 3 were seen, it's good to have got the year off to such a positive start.